Israeli soldiers abducted, Sunday, fourteen Palestinians from several parts of the occupied West Bank, including Jerusalem, the Palestinian Prisoners’ Society (PPS) has reported. The soldiers abducted two Palestinians, identified as Nour al-‘Ajlouni and Hasan Ayyad, after stopping them near Bab al-‘Amoud, in occupied East Jerusalem. Also in Jerusalem, the soldiers abducted two high-level Islamic officials of the Al-Aqsa Mosque, identified as the Head of the Council of Islamic Affairs and Holy Sites in Jerusalem, Sheikh Abdul-Athim Salhab, and the Deputy Director General of the Islamic Endowments Department in Jerusalem, Najih Bkirat. The soldiers also abducted one Palestinian from occupied Jerusalem, while heading to Jericho along with many other Palestinians accompanying a former political prisoner to the city. 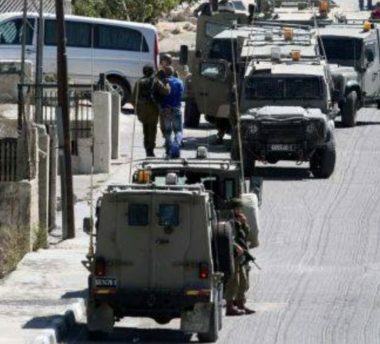 In Qalqilia, in northern West Bank, the soldiers invaded and searched many homes in the governorate and abducted Mustafa al-Haj Hasan, Daoud Shanty, 23, and Mohammad Abdul-Latif Daoud. In Jenin governorate, in northern West Bank, the soldiers abducted a child, identified as Amir Rabea’, from the al-Yamoun town, west of the city, and installed a roadblock n the Jenin-Haifa road before stopping and searching dozens of cars, while interrogated the Palestinians and inspecting their ID cards. Furthermore, the soldiers abducted Mohammad Ashraf Issa and Samed Mahmoud, from in the al-Khader town, in addition to Hamza Abu Yabis, from Deheishe refugee camp, south of Bethlehem, after the army invaded and violently searched their homes. In Ramallah, in central West Bank, the soldiers searched homes in Beit Rima town, northwest of the city, before abducting Mohammad Aziz Rimawi and Morad Karim Barghouthi. In related news, the soldiers abducted two young Palestinian men near the perimeter fence, in Beit Lahia, in the northern part of the besieged Gaza Strip.